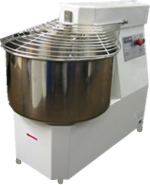 A choice of 4 spiral dough mixers to suit your requirements. These heavy duty professional dough mixers are designed to surpass the demanding requirements of every day use. All mixers include features such as high torque heavy duty motors, gear box driven, safety guards, stainless steel bowls and much more. These spiral dough mixers come with fixed bowls and single speed control. You can choose from a 21 litre dough mixer up to a 52 litre dough mixer.